Chinese New Year ("chunjie") is just around the corner. By Chinese tradition, it is one of the most important festivals of the year. It usually starts from the first day – which is the new moon in the lunar cycle – and ends on the 15th day. The last day is celebrated as the Lantern Festival. The New Year commences somewhere between 21st of January and 20th of February each year and is almost a month later than the Gregorian calendar. In 2019, the lunar new year begins on Tuesday, Feb. 5, and marks the start of the Year of the Pig. The pig, as per the Chinese zodiac, is the last of the twelve animals and symbolizes diligence, kindness and generosity. The year 2019 is thus predicted to be a year of fortune and good luck. The Chinese zodiac includes five types of pigs, which are named after the five elements: Metal, Water, Wood, Fire and Earth. The other animals in the Chinese zodiac, in order, are Rat, Ox, Tiger, Rabbit, Dragon, Snake, Horse, Goat, Monkey, Rooster and Dog. According to legend, the Jade Emperor once threw a big party and decided that the order of the animals would be defined by their arrival at his party. The pig was late because it overslept, and so it became the last of all the animals in the zodiac. Chinese New Year, popularly known as the Spring Festival, originated sometime between 1600 and 1100 B.C., during the Shang Dynasty. There are many traditions associated with the festival. A few of them have faded with time, while others are still in practice. Among those traditions, the most prevailing one is to welcome the New Year with clean surroundings. For this, Chinese people clean their homes and clothes and shop for food, decorative items, new clothes and gifts for friends and family. Additionally, the red sign with the Chinese character "fu" – which means blessing or happiness – is hung on the front doors of homes and red lanterns are hung outside for embellishment. 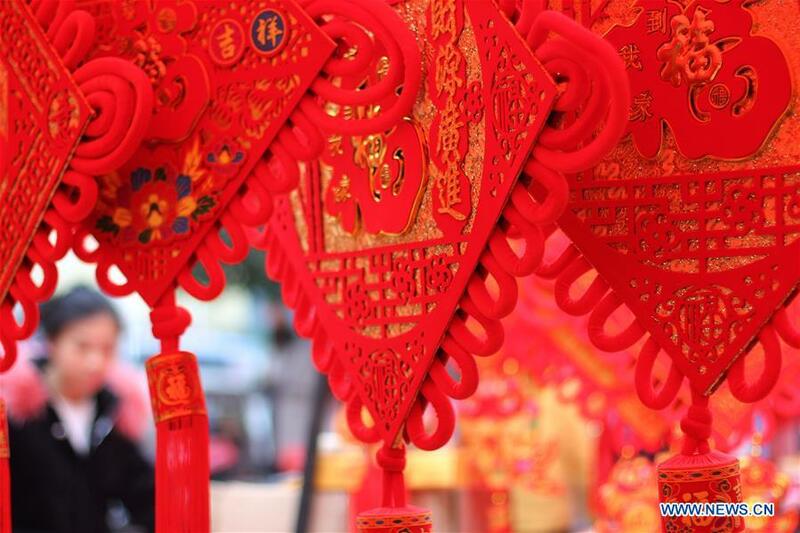 The eve of Spring Festival is of utmost importance for Chinese families. Usually, all the family members reunite to prepare the food and eat dinner together. Generally, chicken, fish and bean curd are must-eat items as the Chinese pronunciations for these foods ("ji," "yu" and "doufu") indicate auspiciousness, abundance, and richness. People in northern China eat dumplings ("jiaozi"), while in southern China, people eat New Year cake made of glutinous rice flour called "nian gao." Following dinner, the whole family watches the Spring Festival Gala on CCTV, which today has become an integral part of the entertainment for the holiday. As the New Year begins, people extend their greetings to their dear ones. Gifts, usually wrapped in red paper, are exchanged and elderly people give money to the young in the form of "red envelopes." Moreover, people like to light firecrackers in the night. As per a mythical belief, once there was a monster named Nian, who came every year to harass people from the village. Finally, an ardent young boy decided to solve this problem once and for all. When Nian came, the boy scared him off with the sound of firecrackers. The monster ran away and never returned. The Lunar New Year is one of the world's most celebrated festivals. Besides China, it is also celebrated in many other countries such as Singapore, Indonesia, Malaysia, Thailand, Cambodia, Australia, Europe, New Zealand, America, Canada etc. because of the presence of sizeable Chinese population. Additionally, Spring Festival brings the largest annual mass human migration in the world. The 40-day period during which Chinese people head home to celebrate the Spring Festival with their families is popularly known as "chunyun." As per the official estimate, the number of trips during chunyun this year is expected to be 0.6 percent higher than 2018, with almost 3 billion trips to be made between Jan. 21 and March 1. However, China is well equipped for this massive travel rush. According to Xinhua News Agency, China launched 10 new railways at the end of 2018 to deal with this year's Spring Festival travel rush. Moreover, facial recognition software and ticket-less travel systems have been introduced to ease congestion and improve passenger movement at train stations. The Spring Festival is also a time of many cultural celebrations such as lion dancing, dragon lantern dancing, lantern festivals, and temple fairs; which are held in almost every city across China for several days. Despite the hardships of the travel blitz, the positive energy that Spring Festival brings – in the form of family reunions, firecrackers, dragon dancing and temple fairs – is truly re-energizing and worth waiting for.